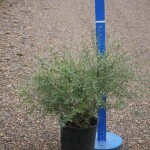 A dense, rounded shrub with slim, purple stems and very narrow, blue-green foliage. This is a good plant for wet areas. Catkins form on the bare branches in early spring. It may be used as a hedge if pruned. It does well in full sun to part shade, poor soils, and is somewhat drought tolerant once established.